UPDATE: I have added larger versions of some of the graphics used in my business card and website design to use or for inspiration. I have also uploaded a picture of the nest thermostat if anyone would like to use that for the thermostat image. I have also added text to go on side two of the leaflet. We provide home technology solutions to different people including training on computers, phones, tablets, TV & audio equipment. We also offer installation services for technology products. I have included some design ideas: amazon, apple, nest and iPost parcels. The design needs to be simple and modern with a friendly, eye catching format. I really like the way the images are on the amazon example and the clean design on all four examples. 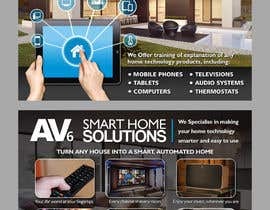 "Home technology explained, by AV6"
Mobile phones, Tablets, Computers, Televisions, Audio systems and even thermostats. We specialise in making your home technology smarter and easier to use. Create the perfect mood with automated blinds, lighting dimmers and exciting colours. Top it off with you favourite music to create the perfect atmosphere. Heat or cool the rooms you use instead of your whole house and control energy usage to make the most of solar energy to save on household bills. 1. Control - Your AV world at your fingertips. 2. Watch - Every channel in every room. 3. Listen - Enjoy your music, wherever you are. 4. Light - Create the perfect mood for every occasion. 5. Heat - Warm and cosy to cool and breezy. 6. Secure - Protect everything that’s important to you. The text and images can be changed to something more suitable. This side of the leaflet is aimed at people who want to make the most out of the technology in their home. This is a new company and we are using these leaflets to introduce our services to potential customers. Although both sides of the leaflet are aimed at different people, there needs to be consistency in the leaflet. We have designed a basic business card, logo and website, in the future we would like to work with the successful designer to renew the look of these with more generous budgets. Other file formats may be accepted as long as they are editable vector based images. Please check #15 . thanks. #6 and #9 please.. thanks!